The Horniman Museum is a fabulous place; it is set amongst sixteen acres of beautiful gardens which overlook the city of London. London museums don't get more original than this. My recent visit to the museum was quite simply a perfect day out. I got to see some amazing exhibits from all over the world in a building which dates back to 1901 and which now boasts a modern new extension which includes one of the best museum cafes I have ever enjoyed. London attractions such as this simply are not to be missed. Admission is FREE to the museum however there is a small admission charge for the Aquarium and temporary exhibitions. This museum was founded by a wealthy Victorian tea merchant, MP and philanthropist in 1901. His love for collecting all things to do with the natural world became so large that he out grew his original home and had to build this very grand museum in its place. He must have had a very understanding family as they lived in this building originally with all the collections around them. I doubt if I would like to live in a house full of Mummies and skeletons bones. The current museum has been updated and arranged to suit the modern visitor however you will still find many of the original features of the museum, which gives the museum very authentic and homely feel. This gallery contains over 22,000 objects and covers the whole of the African continent and other ancient civilizations. 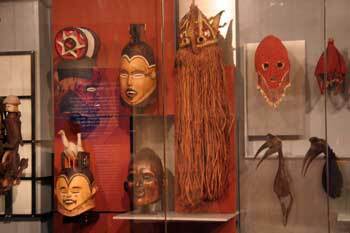 Including Mummies from Egypt, Vodou Altars from Haiti, African masks and ceremonial objects. The Vodou Alter from Haiti Really caught our eye, it is both fascinating and creepy at the same time. Something between a horror film and a celebration. The altar is dedicated to spirits who have passed over and this would constantly be changed and added to as people died and their spirits had passed over. This gallery was one of the quieter rooms in the whole place. It is tucked away on the lower floor and is kept quite dimly lit so as to not damage the artefacts enclosed. This gallery contains some amazing objects from every continent of the world. There are golden Buddas from Japan, Native American headdresses and lots of strange items relating to societies pecking order. There is a small charge to enter the underground aquarium. At the time I visited it was 2.50 for adults which isn't very much at all considering that this Aquarium is brand new and contains so many creatures. There was always an underground Aquarium at the Horniman Museum but the old one was very much in the Victorian style with small display tanks around the wall. The aquarium is very much state of the art and is designed to both entertain and inform the visors about marine life. These two videos are much better at letting you know what you will see when you visit. This area of the Horniman museum really does take you back in time to when the museum was first opened to the public. 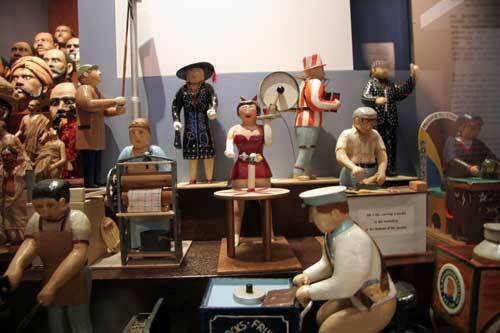 The displays are still contained in their original Victorian cases and are arranged in a very higgledy piggledy way. Originally there were life sized models of giant mammals all through the middle of this gallery. 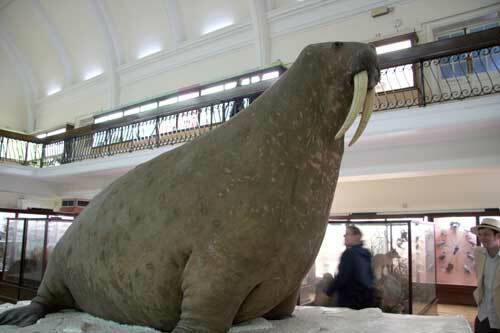 Sadly most of these have been lost however the Giant Walrus still remains and it is spectacular it all its hugeness. This was one of my favourite parts of the museum, it was so interesting to see how people in the past viewed the world and where their interest lay compared with what the modern museum visitor expects. If you like your music and musical history then this gallery is for you. 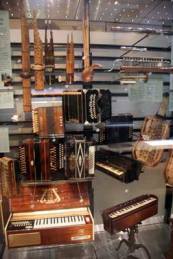 It contains one of the most comprehensive collection of musical instruments which number around 1,600. There are interactive displays and opportunities to try out different musical instruments for yourself in little side rooms. Also as you walk along the display above your head are placed speakers which play music matching the display in from of you. I think they are directional speakers because as you move a few steps to the next part of the display you can no longer hear it. 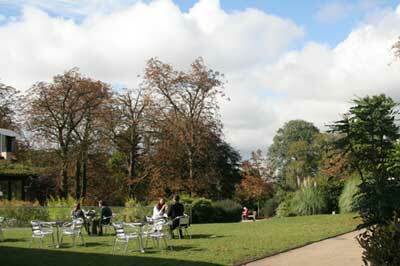 The gardens are spectacular and are divided up into lots of different areas. There's a sunken garden, a meadow field, a bandstand and a nature trail to mention just a few areas. 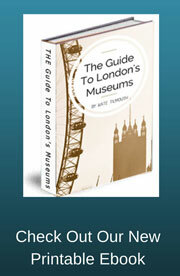 The museum is situated on top of a hill and so the views looking down across London are simply stunning. I couldn't believe how far you could see and on a clear day just how many landmark buildings you could pick out. There is also a fantastic Victorian conservatory which is used as an overflow for the Cafe and for School visits. The Horniman museum was a fantastic day out. I spent about 4 hours there and went to the cafe twice (it was very good and reasonably priced). I will certainly visit again soon. To see more picture from my day at the Horniman Museum check out my Image gallery for the Horniman here.